Robin Burks originally contacted me in early October. Seeing that she’d published one of her Nanowrimo novels, I invited her to write a guest post here about character development. 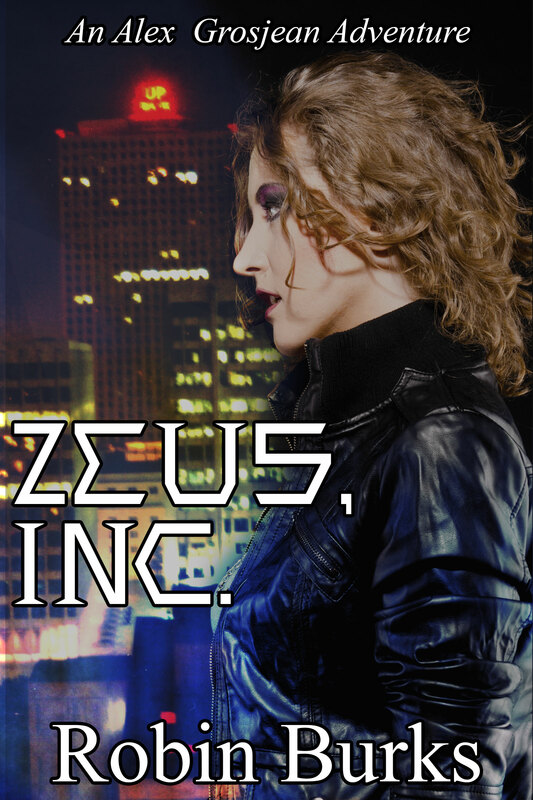 I also agreed to review her book, Zeus, Inc.
Zeus, Inc. is a novel that’s hard to classify. It reads like something between a detective novel and an urban fantasy novel, and is even borderline science fiction. The story is set several decades into the future, after the world has nearly run out of power and been saved by a renewable energy source found by Zeus, Inc.’s CEO, Joseph Brentwood. At the beginning of the story, Mr. Brentwood goes missing. Alex Grosjean, the wonderfully smartassed main character, is hired by his daughter Alisha to find him. Black outs start happening all over the place and Alex believes they’re somehow connected to Mr. Brentwood’s disappearance. She soon discovers that nothing is really what it seems to be, especially not Mr. Brentwood himself. There are a lot of really cool things about this story. For one thing, it makes extensively detailed use of several aspects of Greek myth. I love stories that have elements of both the real world and mythological ones. In Zeus, Inc. Alex actually goes into Hades and meets a large cast of Greek gods. These gods were masterfully represented and I appreciate the detail of this part of the story. One thing I found odd but amusing was Alex’s reaction to discovering that she was dealing with gods. She’s suitably shocked, but not suitably cowed. She continues to defy the gods and doesn’t treat them with any of the expected reverence. She treats them like normal people anyway. Now, I know a few people who I think would react much the same way, but it’s still pretty hard to believe. I enjoyed reading it, but I did read with one eyebrow raised as she cursed at the gods without a second thought. Really though, my main complaint about the book is that it felt over written. The story was wonderful but I felt it could have used some more editing. Sometimes I would find things said twice but in slightly different ways, and other times I would find redundant words. I think that this book could have been much more closely edited, looking for instances of things like “she sat down“(down is implied by sat) and other small things that aren’t technically incorrect but still look sloppy. I saw a few more typos than I usually find in traditionally published books, but mostly the issue was over explanation of everything. The only thing that bothered me about the story is that Alex at one point gains some supernatural power of her own, but it feels like the power is foreshadowing because it’s never properly explored. She never even really takes the time to learn how to control it, but it only causes her one problem–I would have liked to see this newfound power take a bigger role in the story. Still, I loved this book. It used mythology in a totally new way, crossed genres a few times and made me laugh several more times. The best part? Ares is afraid of Alex’s cat. A war god who’s afraid of cats? That’s comedy gold right there. I would definitely like to see more Alex Grosjean stories as she’s a wonderful character and I love the things that spring from Robin’s imagination, but I hope that if a second novel in the series is published more time is taken to edit it thoroughly so it’s a smoother read. I give Zeus, Inc. a 3/5 star rating. You can purchase it for just $3.00 here. Robin’s Bio: Robin Burks is not only a novelist, but also writes for RantGaming.com, Syfy Network’s DVICE.com and as well as her own blogs – FanGirlConfessions.com and Robin-Burks.com. Robin’s first novel, Zeus, Inc., is now available on Smashwords, BN.com, Amazon.com and in the iBookstore. She also occasionally speaks French and loves Doctor Who. Tags: Alex Grosjean, book reviews, books, Fantasy, mystery, reading, Robin Burks, science fiction, urban fantasy, Writing, Zeus Inc.
Today’s market listing is focused specifically on anthologies. Anthologies are a great way to join a bunch of other writers in creating something and to get your name out there. They almost always have specific themes, so unless you happen to have something suitable on hand, you’ll probably have to write a story specifically for the anthology you want to submit to. The Fantasy Faction Anthology Created by a well known speculative fiction blog and forum called Fantasy Faction, this anthology will contain several non-fiction articles as well as stories written by well known authors. For those of us who aren’t so well known, they are holding a contest which includes six publication places and three cash prizes. Shanghai Steam This anthology is an attempt to delve more deeply into steampunk from an Asian point of view. It looks like a really cool concept anthology and they pay $0.03/word up to 3, 000 words. Bibliotheca Fantastica Dagan Books is looking for stories about books–rare, weird, maybe even magical books–of up to 10, 000 words. I think this is a great idea for an anthology and I’d love to get it in my stocking, even if I’m not really sure I have anything to submit to them. They pay two cents per word. Dark Faith 2 Run by Apex books, the same people who run Abyss&Apex the magazine, this anthology is looking for the story that only you can write, something that’s both deeply personal and universal. It’s a good idea to read the first one before submitting to this one. I hope you find at least one of these anthologies to be worth submitting to. Don’t forget to go through the guidelines thoroughly and to make sure the deadline doesn’t slip past you. If you miss a reading period for your favourite speculative fiction magazine, there’s always another one, but it doesn’t work that way with anthologies. While some of them are annual, it’s best to assume that it’s a one off and that you only have one chance to get into that market. For anthologies, I suggest reading the guidelines three times. The first time is when you find the anthology. The second time should be after you finish the story you’ve written for the anthology, and the third time should be right before you submit, after edits. No matter how awesome your story is, if you don’t read the guidelines, your story might be formatted incorrectly and it might just end up in a trash can, virtual or real. You want to always give your work the best chance possible. Today I am very pleased to introduce Stephanie Campbell, author of Dragon Night. I am currently reading Dragon Night, published by Urania, Musa’s speculative fiction imprint, on the Kindle I got for Christmas. I’m more than halfway through the book and I’ve enjoyed every step along the way. It’s a great honour to have her here today. 1. Can you tell us a bit about yourself and your book, Dragon Night? I’m twenty-one years old and have been writing since I was twelve. People in the publishing world often tell me that I’m “still a baby.” I have heard that phrase used on me quite often. I’m a go-getter, at least when it comes to the things that I want and love, so I don’t let my age or anything else get in my way. I think that’s how I first ended up published. The poor editors probably got so darn sick of me harassing them that they decided to throw the dog a bone. I got my first book, Until We Meet Again, published when I was seventeen. Since then, I’ve had the books Poachers, Where All Rivers Meet, P.S. I Killed My Mother, and yes, Dragon Night, published. Dragon Night is my favorite book out so far. It’s about a boy who discovers that his father isn’t really his father. He goes on a quest to find his biological dad, and along the way he discovers that he’s a half-dragon in a world where dragons and half-dragons are at war. I tried my hand at a few different things, still writing all the while, but I was miserable that way. That was when I realized that I was being very dumb about the whole thing. I wanted to be a novelist. The best things in the world take time. Listening to myself was the smartest thing that I’ve ever done. I’ve got a ton of book contracts out right now, and I’m very successful under multiple pen names. I think some part of me always knew that I was destined to be a writer. I just had to have enough faith in myself to believe that it was possible for me. 3. What made you decide to write fantasy? Because I love the idea of disappearing in another world completely. Harry Potter did something to me—well, I’m pretty sure that it did something to most kids. J.K. Rowling is a brilliant woman. I’m still waiting for my letter from Hogwarts, and I’m still harboring a deep rooted belief that I am actually a fairy that was swapped out of the real Stephanie’s crib. YA fantasy is what I love to read. 4. Have you ever tried your hand at other genres? Yes, I write in every genre—quite literally. I have an adult mystery and an adult sci-fi coming out. (Case Closed has a superb cover .) I have a YA drama. I’m currently writing an adult suspense called Racing Death, about a man who’s trying to save his significant other’s life. Basically, you name it, chances are good that I’ve written it…except for non-fiction. I’ve tried it, but I just can’t do it, even if it’s regarding a top that I know everything about. 5. What does the writing process look like for you? Step 1) I’ll get the idea, which usually happens when I’m writing a completely different book. Step 2) I’ll outline it chapter by chapter. This usually takes me about thirty minutes, and the book will look completely different by the time that I’m done. Step 3) Write the book. This step usually takes me a month and a half. Step 4) I’ll put my book in my “limbo” pile. I won’t touch it for two months. Step 5) Edit the book twice. This step usually takes me two months. Step 6) Go back. Pout. Edit for the third time. Step 7) Send to one of my editors. Step 9) I’ll review the cover, galley, and publicity details. Step 10) Done! I’ll go to eat some ice cream. 6. What is the most challenging part of the writing process for you, and how have you learned to make it easier for yourself? The third time edit. I love my books. They are seriously my children. But have you ever had a child during a difficult stage that has temper tantrums over and over again, and you seriously can’t control them no matter how hard you try? Even parents need a “time out” sometimes where they have to go someplace alone and breathe, that way they can be a full and calm parent again. They still love their child, but they need a breather. That’s how I feel about my third edit. Little mistakes slip in. I read all of my manuscripts out loud times, and my third time is my breaking point. Those words are “screaming” out at me. I feel sick of my story line and am mad at my characters. In order to deal with it, I will occasionally put my book in “limbo” again. That’s what happened with my sci-fi, and now it’s fine. If someone is waiting on the manuscript, then I give myself rewards for finishing it. I remind myself of the reasons why the book was written, even if by the third run I feel like I’m reading a terribly story. 7. Who are some of the authors that inspired you to start writing? J.K. Rowling—I know that it’s silly, because everybody adores her. I just respect her grit. I mean, Harry Potter, one of the best books in human history in my opinion, almost didn’t happen. She was divorced and a single mom who couldn’t get a job, and she did something incredible during her hard times. She isn’t just a literary genius, she’s a person who deserves respect for not giving up. She deserves all of the wonderful things and the money that she’s received. If I can eventually become half of the woman that she is, then I’ll consider my life to be complete. 8. How did you decide on eBooks versus print books? Actually, I go both ways on that. I would rather have my book be an eBook if it gets the time and attention that it deserves. I actually prefer paper if the publishers had an equally good staff, but nobody will buy an unknown print book, even if it’s on paper. 9. Why did you choose Musa Publishing instead of another ePublisher? 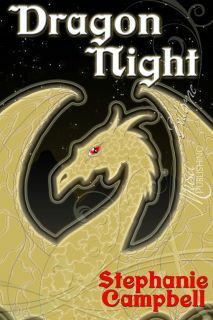 Dragon Night went to Musa Publishing because I adore Celina Summers, my editor who was over at Aspen Mountain Press. My book was picked up there, but I ended up declining and giving my manuscript to Musa. It was a great decision, even if Dragon Night never does make it to print. (Though I hope it will.) Musa has a fantastic team. You can purchase Dragon Night here. I don’t know about you, but this year I’m planning on making several submissions and hoping for at least a couple of publications. Most of the markets I’ll be listing are markets that I’m thinking about submitting to. I will only be listing paying markets, as I will only be submitting to paying markets this year. For now all of the markets I’ll be listing are for speculative fiction. Almost all of the markets I’ll be posting accept electronic submissions, but don’t forget to read the guidelines thoroughly before you submit. These markets accept longer short stories, for the most part under 10, 000. I’m hoping to find a home for the short story I just wrote, and maybe you will too after reading this list. Abysss&Apex Magazine of Speculative Fiction Abyss&Apex accepts stories of up to 10, 000 words. They run on a quarterly schedule and have set fiction reading periods. The next one is in February. Payment is five cents per word up to 1, 500, with a flat payment of $75.00 for longer works. Lightspeed Magazine Originally just a science fiction magazine, Lightspeed recently merged with its sister magazine to start accepting fantasy submissions. They are not accepting fantasy submissions until further notice. Paying five cents per word and accepting stories up to 7500 words long, this is a market to watch. Strange Horizons This magazine is looking for speculative fiction stories of up to 9, 000 words. They do prefer shorter stories of under 5, 000 words, but it’s perfectly fine to submit a story between 5, 000 words and 9, 000 words. Strange Horizons pays its writers 0.07 cents per word. They are currently not open to fiction submissions, but they will re-open for fiction submissions on February first. I hope that you’ll submit your fairly long short story to at least one of these markets. If you manage to find a home for one of your stories thanks to a market I sent you, let me know. I’d love to hear your success stories. If you’re too shy to comment, shoot me an email at diannalgunn@gmail.com . Do you plan to submit more short fiction this year than you did last year? Ordinarily my first post after the end of November would be something about what to do now that you’ve written your Nanovel, and while that post is coming, this year it’s been made to wait. That’s because I would like to introduce you to the other project I’ve been working on all month, the Penumbra eMagazine. Penumbra is the speculative fiction eMagazine run by Musa Publishing, the ebook publisher I’ve been interning with for the past three months. Since late October, I have been working with a team made up of all of Musa’s interns to make December’s issue of Penumbra the very best that it can be. It’s been an amazing journey from raw story files to a polished and professional emagazine. Throughout the month we worked together to make basic decisions like story order and ad placement, and we worked with cover artist Lisa Dovichi to make this issue of Penumbra as pretty as it could be. I also had the pleasure of interviewing Vella Munn, author and granddaughter of Homer Eon Flint. It’s been an educational experience and I’m thrilled to be part of an awesome team. Penumbra is just one small part of Musa Publishing, which really is a power house press that I can see going wonderful places very quickly. 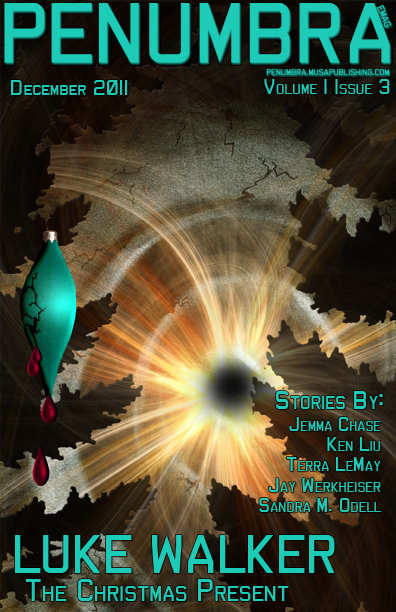 You can buy the December issue of Penumbra here. But that’s not all we’ve been working on. When we were given the task of creating the December issue of Penumbra, our Editor in Chief gave us another challenge: to get Penumbra 500 subscribers by January first. We’ve gotten in touch with a number of bloggers and authors with varying responses–and of course in any situation like this the most common one is none at all–and we’ve begun to revitalize Penumbra’s blog. In honour of the giving season, we also decided to create a special offer. When you purchase your one year subscription before January first you will receive the first two issues of the emagazine free. The $36.00 subscription is the perfect gift for yourself or any avid reader you know. And how better to reward yourself for completing Nanowrimo than by reading? Because Penumbra is an emagazine, as soon as you’ve bought your subscription, you can curl up with your favourite tea and start reading. I’m really excited to present today’s author, Jamie Grey. Most of the interview choices I’ve made so far have been based on publisher-with a special focus on MuseItUp-or nationality, the latter usually being Canadian. I chose Jamie Grey from a list of MuseItUp publishers specifically because I thought her story sounded fantastic, and I’m hoping I can get my boyfriend to buy it for me since I don’t have a credit card. I hope you enjoy this interview and I hope that you check out Princess for Hire when it comes out on March 1st. Jamie will be hanging around today to answer any questions you might have. 1. Can you tell us a bit about your story with MuseItUp Publishing, Princess for Hire? After winning his kingdom in a legendary poker game twenty years ago, Princess Mina’s father loses the kingdom just as easily. Now alone and penniless, Mina must rely on her sword to support them both. When the princess-turned-mercenary is offered a contract to save a prince that will pay enough to keep her father in luxury for yet another year, she and her business partner snap up the deal. Dragons and all. 2. When and how did you decide that you wanted to become a writer? I’ve wanted to be a writer since I could read. I used to make up little books for my mom with illustrations and everything. But I finally got really serious about writing three years ago, found some critique partners and started working on my craft. 3. How did you first come up with the story of Princess for Hire? I wanted to write something that was a bit of a twist on the typical handsome Prince rescues beautiful, helpless Princess story so often seen in Fantasy. And I wanted to play a little with changing gender roles and expectations. Somehow, Princess for Hire was born from that. It varies for each project, and if it’s a full length novel vs. a short story, but usually, I try to come up with a basic plot outline to work from. I try to hit the important plot points, get a sense of the characters, and ending. Then I write – I basically just get the words on paper as fast as I can, not worrying about editing as I go. The editing process takes a bit longer – I usually sit down with the manuscript and do a read through, marking plot holes, inconsistencies, problems, etc, and then come up with an editing plan. After that first pass is complete, I start working on the details – wordsmithing, description, characterization, setting. On average – a novel takes me 6-9 months to have polished and ready to submit. A short story might only take me a couple of weeks. One of my fantastic critique partners submitted a novella to a brand new Canadian ePublisher last year and really loved working with the Muse team. When I found I had a short story I wasn’t sure what to do with, she suggested that I try submitting it there. And the rest is history! 6. What’s your favourite thing about working with MuseItUp Publishing? Everyone that I’ve met at Muse has been fantastic! The other authors are friendly and supportive, and Lea, the publisher, goes above and beyond to take care of her writers and editors. It’s just been a really great first publishing experience. I’m afraid I’m spoiled for anyone else! 7. Do you think ebooks will take over and that print will… go out of print? I have to admit that I am a total bookworm. I love the feel and experience of reading a “real” book. That being said, I do think ebooks will take over – probably sooner rather than later. The ease of immediate downloads, the ability to read anywhere/any time, and the availability of millions of works at your fingertips will almost guarantee that ebooks are the way of the future. I don’t think print books will ever entirely go away though. There’s just something about having that book in your hands. But what I’d really love is if publishers moved toward the DVD model – you buy the physical DVD and also receive a code for a digital download at the same time. That would be the best of both worlds! 8. Your story Princess for Hire isn’t a full novel. Are you planning to move to writing novels? It’s funny – Princess for Hire is actually a bit of a departure from how I usually write! I am most definitely a novelist. I love the freedom of having 80k words to play with to craft a story. However, my crit partners and I came up with a short story challenge last year and this was my attempt at playing with the form. It’s actually the first short story I’ve written in a really long time! I’m back to writing novels now, but I may take a stab at another short story in the future. Maybe I’ll even continue Mina’s story! 9. What are you working on right now that readers can look forward to? I am working on a full length YA novel set in Japan. It’s a contemporary fantasy about a Dragon, and the two girls from two different eras who must save him. I’m hoping to have that out to query by late spring. The book on my nightstand right now is The Marbury Lens by Andrew Smith. It’s an interesting read – it’s targeted as YA, but it definitely feels much older and darker than what I’m used to. I also have Paranormalcy by Kiersten White sitting beside my bed. I can’t wait to get to that one! 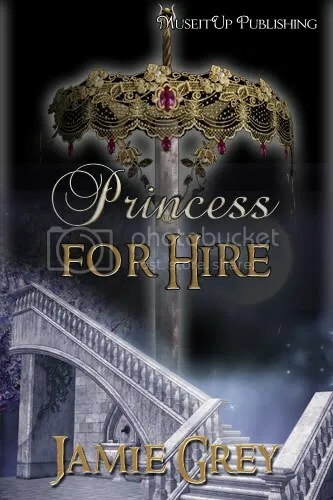 If Princess for Hire sounds like something you might be interested in, I have an excerpt up at my website: http://www.jamiegreybooks.com and you can check out my blog there as well. Princess for Hire will be available March 1st from the MuseItUp bookstore. Bio: Writer. Geek. Tech enthusiast. Tea diva. I’m either a multi-faceted young-adult author or a commitment-phobic escapist. Probably a little of both. Residing near Ann Arbor, Michigan, I spend my days writing as an instructional designer. At night, I try to create fantastic worlds populated with remarkable characters. Some days are better than others. Did you find this interview interesting?